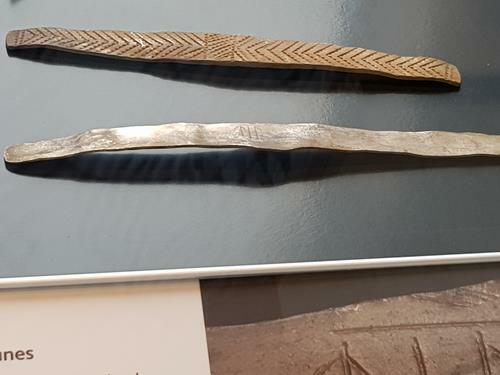 In August 2017 I visited Edinburgh and saw that there was an exhibition of the Galloway Hoard in the Museum of Scotland and decided to visit. The Galloway Hoard is considered to be the richest hoard of unusual and rare Viking objects ever recovered in the British Isles. 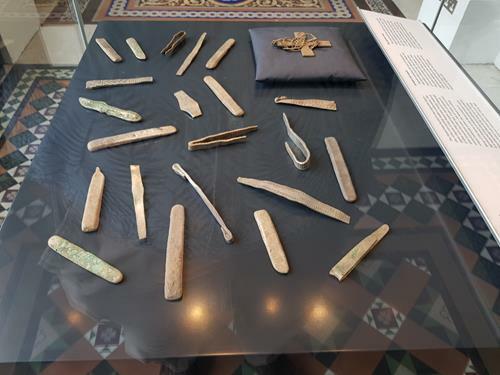 In the 10th century an unknown individual buried a treasure trove in what today is Dumfries and Galloway. There it lay for over a thousand years until a party of metal detectorists located it about 3 years ago in 2014 on land that belongs today to the Church of Scotland. The group called in the county archaeologists who started up a dig on the land, which revealed a number of artefacts. One of the early objectives located was a silver christian cross. Further investigation was undertaken – including digging a trench. Concern over possible vandalism or theft led to the local farmer stationing a large bull in the field as a body guard at night! 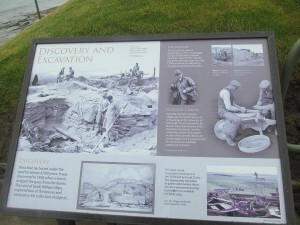 The efforts were not in vain as this activity led to the discovery of an even deeper stash of treasure – meaning that the treasure has been buried into two layers or maybe at two different times. In addition evidence was unveiled about the presence of a building. Perhaps the horde had been buried inside, or near to or under a monastic building. This discovery comprises more than 100 objects. 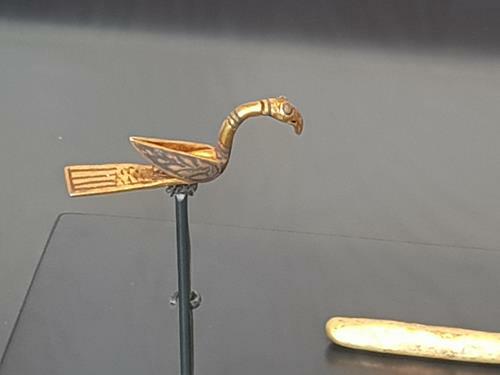 One of the finest pieces is a unique gold bird-shaped pin. The presence of these articles raise questions. 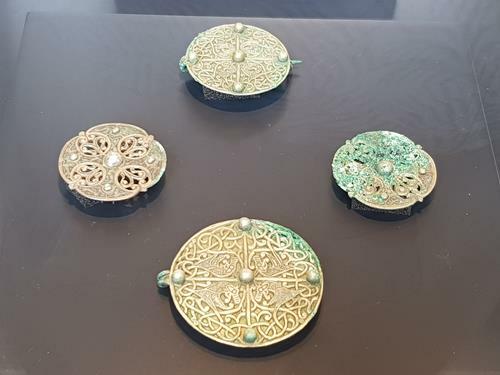 Could these represent Viking booty from raids in England or maybe there were gifts or simply traded? We do not know. 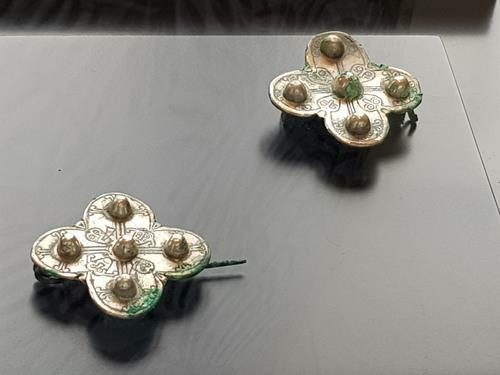 Other brooches of interest are two examples of a quatrefoil brooch: an usual design. 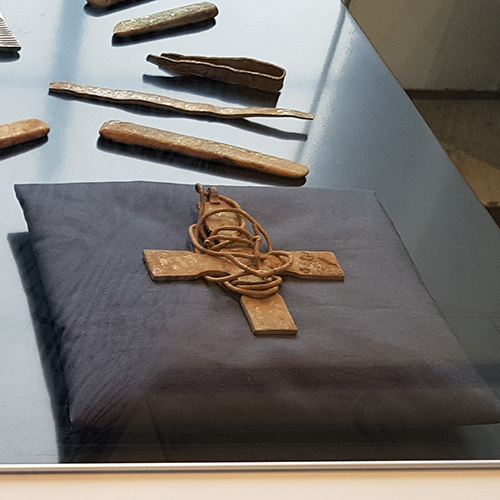 Several of the objects have clear signs of Viking runes (the script that the Viking Norse and Danes used.. There are also gold arm rings. Warlords and Vikings of rank rewarded loyalty by handing out precious arm rings to followers. The exhibit includes a short video and explanatory panels. 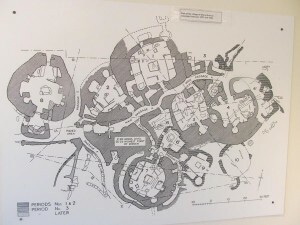 There is currently an appeal to raise just under £2 million in order that the horde can be preserved and studied further and its secrets discovered. I would like to wish you all a Happy New Year. Hoping 2017 is a good year for you. Thought I would share some more images from my summer 2016 trip to the Orkneys and take a look at Skara Brae. 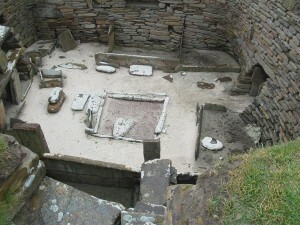 Skara Brae is the best-preserved Neolithic settlement in Western Europe. 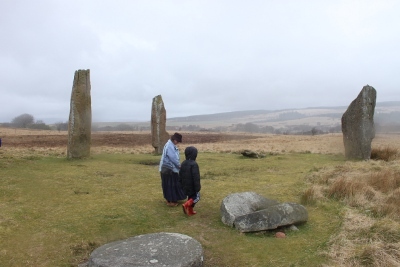 This site dates back 5000 years to a time long before Stonehenge or even the Egyptian pyramids were built. It was once a thriving village and then was lost to history, buried under the sand until a freak storm in 1850 revealed an extraordinary site. In the winter of 1850, a great storm battered Orkney. The islands are exposed to the fury of the Atlantic on one side and the North Sea on the other. Even in August (when I visited) winds can be high. 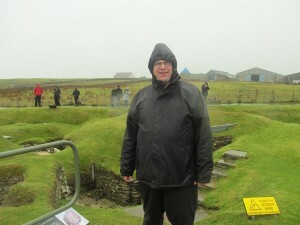 You can see that is was very wet and windy when we visited this site. On the occasion of the 1850 storm, the combination of wind and extremely high tides stripped the grass from a large mound to reveal the outline of a number of stone buildings. 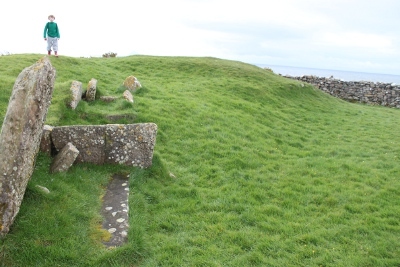 The local laird, William Watt, of Skaill, embarked on an excavation of the site in 1868 when the remains of four ancient houses were unearthed. After this, work was abandoned for a generation. Then between 1928 and 1933 more work was done – eventually revealing an entire village. 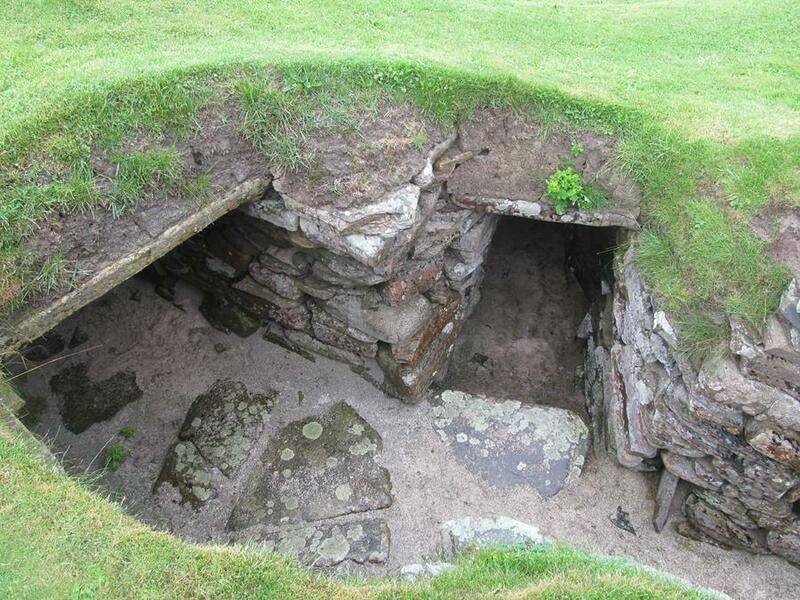 In the 1920’s the village was thought to be an Iron Age settlement, dating from around 500BC. 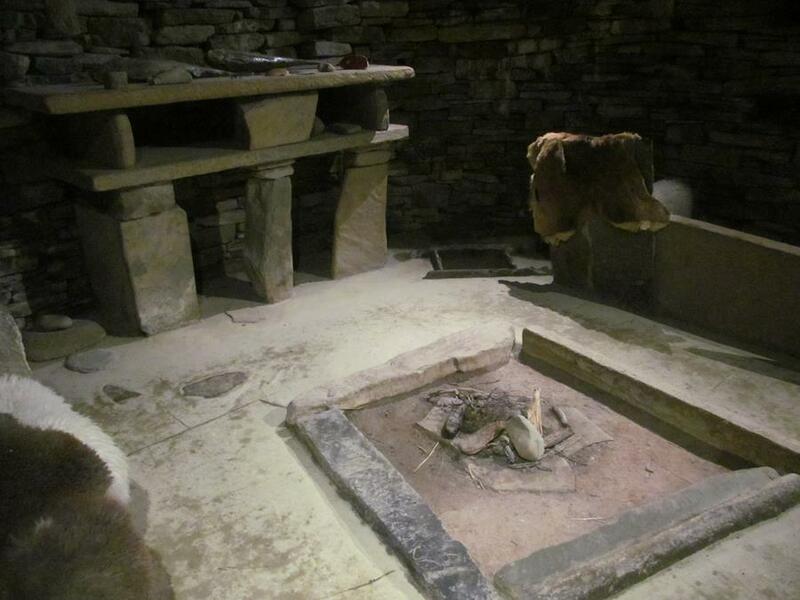 It was radiocarbon dating conducted in the early 70’s that confirmed that the settlement dated from the late Neolithic. 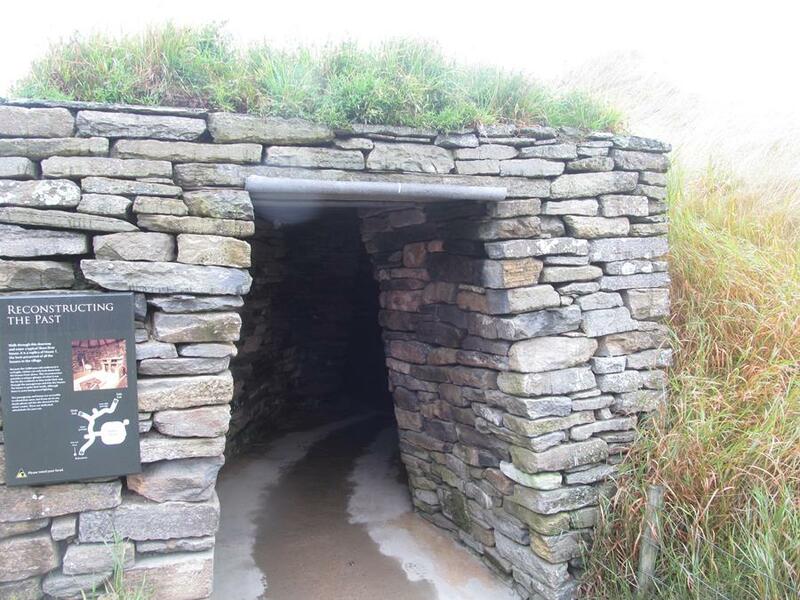 It was believed to have been inhabited for around 600 years, between 3100BC and 2500BC. Skara Brae was fortunate in that due to the protection offered by the sand that covered it for forty centuries, the buildings, and their contents, are incredibly well-preserved. 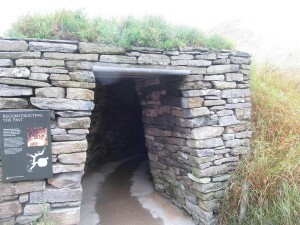 The site has eight dwellings, linked together by a series of low, covered passages. Many of the walls of the structures and even the roofs were intact. Each of the eight houses are built to the same basic design. 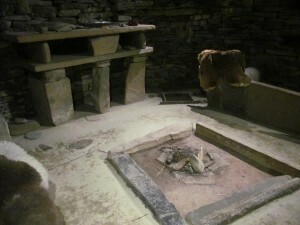 There is a large square room, a central fireplace and beds raised on stone shelves on either side. 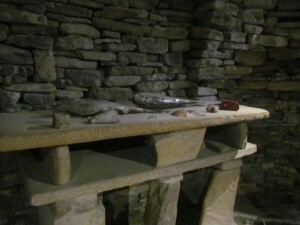 There is even a stone dresser and food storage pits. The site was lived in for six centuries. 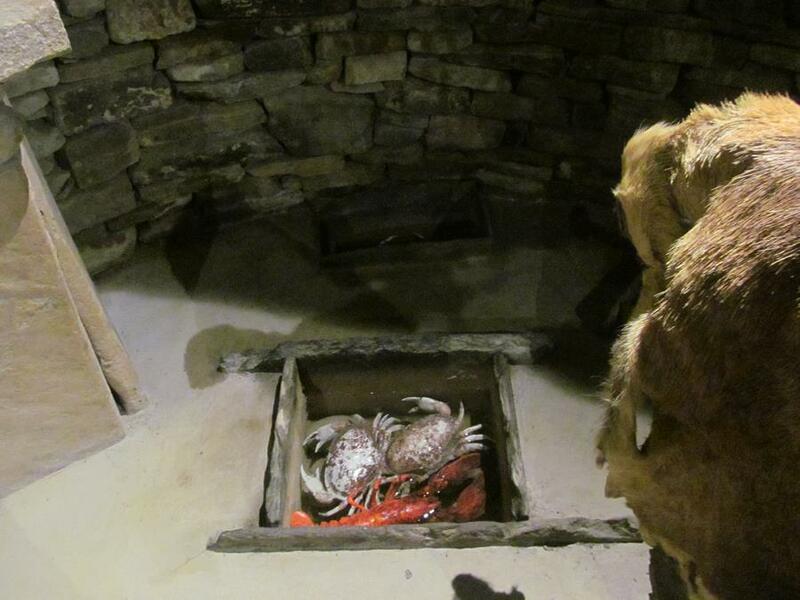 The inhabitants piled up rubbish and refuge in the passage ways and rooms until Skara Brae became embedded in its own garbage. It is also believe that the sand dunes encroached on the site so that around 2500 BC the village was finally abandoned. The visitor centre has a nice museum about the site complete with movie, finds and a small reconstruction of part of passageway and one of the houses. There is even a fridge. The remote south end of the Kintyre peninsula is a wind swept spot. Roads are poor and usually single track. To get to the Mull (the point where Scotland and Ireland are but 12 miles apart) involves a 7 mile drive down a windy very narrow track with occasional passing points to allow cars to pass. Not that we did pass a car on the way down it. Reaching Mull we gazed across to Ireland and then beat a hasty retreat as wind and rain descended. Twenty minutes later we were at Southend and St Columba’s footprints. The sun was out and it was really quite pleasant. This spot saw three events in history over 11 centuries. Firstly in 563 A.D. this was the spot where St Columba was supposed to come ashore from Ireland. 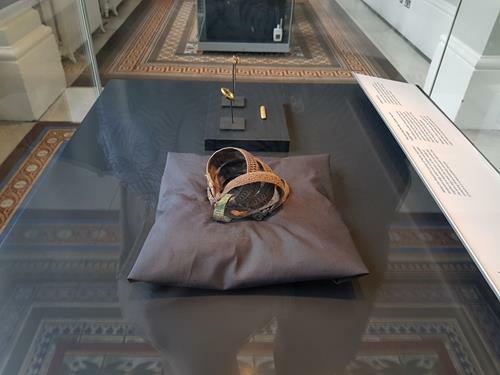 Columba was a christian missionary who brought Christianity to the picts as well as getting heavily involved in their politics as well as that of the Irish Scots who were settling Argyll . He was a friend of the kings of the Dal Riata Scots who granted him land in Iona – which became holy Island and the focal point for Celtic Christinaity. 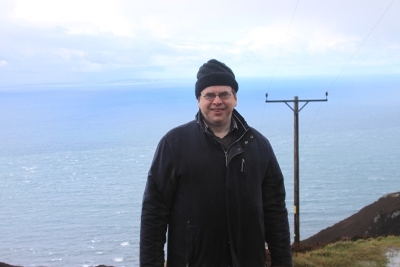 Much of what we know of the nations, kings and politics of Scotland in the 6th centuries is through the eyes of Columba’s biographer Adomnan. Near the shore here are stone footprints cut into the rock. 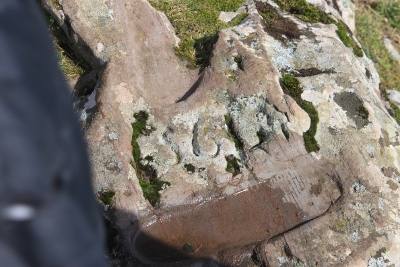 They are called St Columba’s foot prints and in the past effort have been made to link them with St Columba. In fact until about 1860 there was but one footprint. A victorian stone mason (called Daniel Mcilreavie) carved the second one in an attempt to stimulate tourism. He even carved a wrong date – 564 rather than 563 as the date they were supposed to have been made by Columba BUT it is much more likely that they are Scot or Pict in origin. 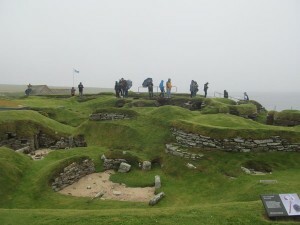 The Scots used foot prints to “claim the land” especially at their main fortress of Dunnadd not far to the north (of which more in a couple of days). 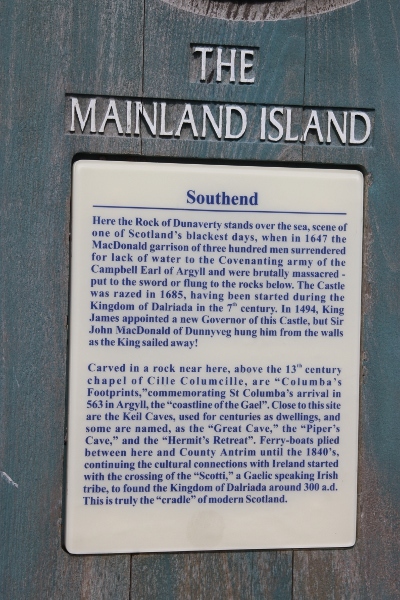 The Scots actually had a fortress here at southend on the nearby rock of Dunaverty. 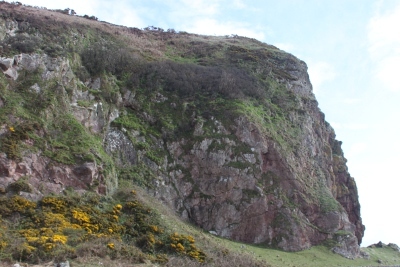 This rock was still home to a fortress when it became involved in a dispute between King James IV and the Lord of the Isles. That title was given to the de facto king of the islands and west coast of Scotland but in 1493 the last Lord of the Isles was required to forfeit his title and pay homage to King James IV of Scotland. 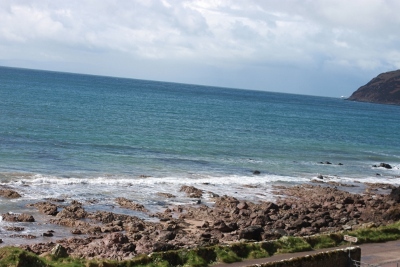 To make sure of his position the King garrisoned Dunaverty Castle with Royal forces in 1494. Sir John MacDonald rebelled and, retook Dunaverty Castle just as the King was sailing away from it, taunting the royal party by throwing the dead body of the castle’s governor over the castle walls. Eventually Macdonald was executed for treason in 1599. In 1645 an army of convenanters slaughtered a Royalist army, who had just surrendered to them, at this very spot and threw their bodies down the cliff or stabbed them with swords. So a spot with several historical events. 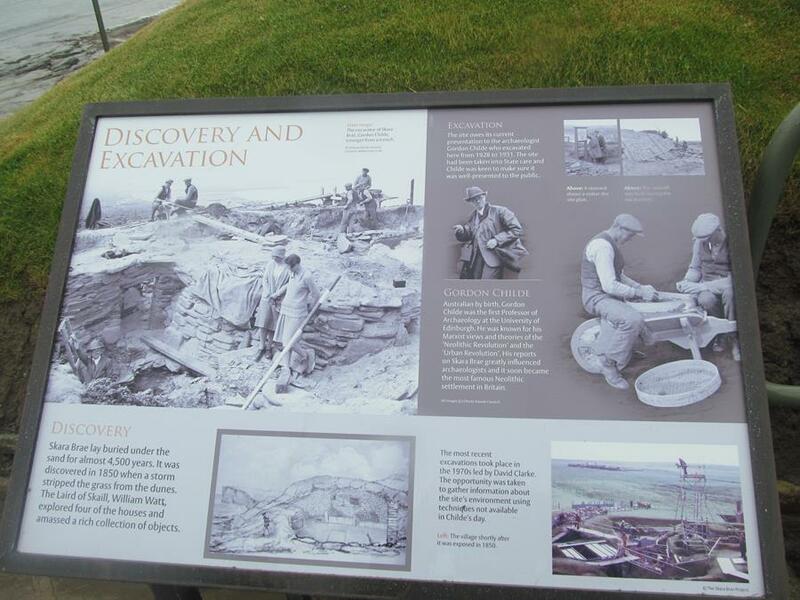 It goes to show that even remote and unlikely spots can play a role in history. I just spent Easter weekend on the Isle of Arran. As with most trips to Scotland the weather can be a bit hit and miss but I love trips up here and try and get “North of the Border” every couple of years. Arran is an island with a rich and LONG history. Along the west shore not far from Macrie Mhor is “King’s Cave” . 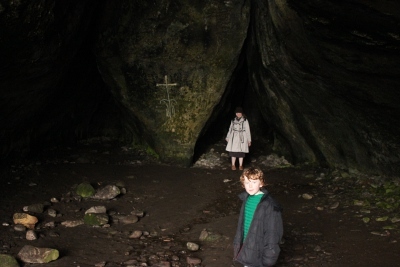 This is one of the caves that it is claimed Robert the Bruce hid from the English in his campaign to free Scotland. Here is where he is supposed to have seen the spider weaving its web, then when the web blown away by wind, the spider tried again. From this he got the inspiration to return to the fight but also the saying “if at first you don’t succeed, try, try again” was invented. 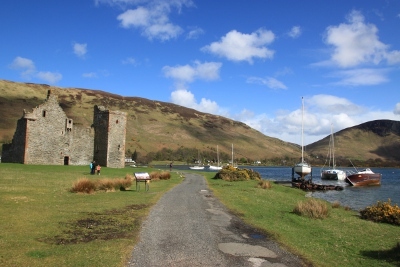 At Lochranza on the northern tip of the island is a small but intriguing baronial castle from 14th century which later became a residence of the local Laird. So, not a bad weekend of walks and exploring. The food in Lagg Hotel was very nice too! !